The Third Provincial Council assembled in New Bern on February 28, 1776. The Continental Congress had recommended to the southern colonies to appoint committees to meet in Charlestown to ascertain the best means of defense against a probable British invasion, so President Cornelius Harnett and his Provincial Council met earlier than originally planned to dispatch the proper delegates - Abner Nash and John Kinchen. Similarly, North Carolina soon thereafter sent delegates on a similar mission to Virginia - Samuel Johnston and Thomas Person. In this Provincial Council, it was also resolved to disarm all suspected persons and this hazardous duty was entrusted to the County Committees. This was not an enviable task and was not to be taken under any circumstances other than war. Meanwhile, the Highland Scots in and around Cumberland County managed to get secret communications through to Royal Governor Josiah Martin aboard the HMS Cruizer. They were quite unhappy with their circumstances and proposed several plans to increase the Crown's influence over the rebels. At the same time, Virginia Royal Governor Lord Dunsmore was planning a secret disturbance at Norfolk. Both Royal governors were well aware that General Sir Henry Clinton was loitering along the Atlantic coastline and in direct communications with both governors, attempting to help either or both of them in their designs. A large group of Minutemen and Militia, under Col. Richard Caswell, met a large force of Loyalists under Highlander Brigadier General Donald McDonald at Moore's Creek Bridge on February 27, 1776 in what is now Pender County. After a sound whipping by the Patriots, the Loyalist "condition" within North Carolina was now at its lowest, not to resurface until Lord Cornwallis invaded the state in 1781. At the summons of Samuel Johnston, the Fourth Provincial Congress assembled at Halifax on April 4, 1776. Allen Jones proposed Samuel Johnston for President and he was unanimously elected. Allen Jones was elected as Vice President. James Green, Jr.was appointed Secretary, James Glasgow as Assistant Secretary, John Hunt as Clerk, and Francis Lynaugh and Evan Swann as Door Keepers. The important question of Independence was moved, discussed, and unanimously approved by this Provincial Congress. On Monday, April 8th, Cornelius Harnett, Thomas Burke, Allen Jones, Thomas Jones, Abner Nash, John Kinchen, and Thomas Person were appointed a committee to take into consideration the usurpations and violences committed by the King and Parliament in Britain, and on April 12th, Mr. Harnett submitted their report, later to be named as the "Halifax Resolves." This unanimous adoption preceded the Virginia Convention recommendation on the same subject by more than a month, but like the Mecklenburg Resolves, it too was forgotten by most historians until recently. Like the Mecklenburg Resolves, the date of the Halifax Resolves is included on the NC State Flag. On April 13th, this Provincial Congress established a committee to prepare a "temporary civil constitution:"
This committee did create a draft state constitution, and it was reviewed - line-by-line - by the entire Provincial Congress. After a brief debate, this Provincial Congress decided to defer completion of the constitution until the next Provincial Congress. During this session of the Provincial Congress, it was decided to "go easy" on the Loyalists who were recently defeated at Moore's Creek Bridge. They decided not to make things worse within the Province. Congress then decided to fortify the defenses along the Cape Fear and in and around New Bern. Two special regiments of Militia, including over 1,500 men, were marched to Wilmington. Both seaports were authorized to outfit and arm vessels to protect their coasts. It was during this session that the Provincial Congress decided to abolish the Minutemen of the six districts and to replace them with "brigades" of Militia at the "district level" to supercede and to superintend the Militia at the "county level." Each district's brigade was now assigned a Brigadier General of Militia, commissioned by the Provincial Congress. This Congress also authorized the establishment of four more regiments of Continentals to be placed upon the line as soon as practical. They commissioned all officers of the newly-created 3rd NC Regiment, 4th NC Regiment, 5th NC Regiment, and 6th NC Regiment, plus three companies of Light Horse. Each county was to continue their regiments with colonels in charge, now reporting to these six brigadier generals. On May 1st, this Provincial Congress appointed William Hooper, Joseph Hewes, and John Penn to the Continental Congress, with instructions to concur with the delegates of other colonies in declaring Independence and to form foreign alliances. This new Provincial Council focused on the priorities of the day - the procurement of gunpowder and other munitions, the judgement and punishment of Loyalists, and an immense quantity of private business. They adjourned on May 14th leaving behind little unfinished business except for the planned Constitution. In the meantime, the British Navy arrived with thousands of troops in many ships anchored off the coast. General Sir Henry Clinton had been a guest of Royal Governor Josiah Martin aboard the HMS Cruizer for almost a month while awaiting the arrival of his entire army, which had been detained in Ireland. Clinton travelled from New York to the Cape Fear and even spent some time with Governor Lord Dunsmore of Virginia in the midst of his engagement with Col. Robert Howe and the 2nd NC Regiment at Norfolk against Governor Dunsmore. Clinton had plenty of time to learn and observe the actual condition of North Carolina, the opinions of the people, and the military policy of the Provincial Congress, as well as benefitting from many conversations with Royal Governor Josiah Martin. His headquarters were, however, besieged by the North Carolina Militia and his many troops were forced to remain onboard their ships offshore. He did manage to land nine hundred (900) troops and attack the plantation of now Brigadier General Robert Howe on May 11th, with minimal damage as a result. The vigilance of the large quantity of Militia surrounding the area led Clinton to give up all thoughts of possibly invading North Carolina. With the Loyalists thoroughly under control after the battle of Moore's Creek Bridge, there wasn't much that Governor Martin could do to convince General Clinton to help him regain control of the Province. Moreover, Clinton had already set his sights on Charlestown prior to leaving New York, and his time with Martin was merely passing that time as conveniently as possible while waiting for his troops to arrive. When they did, he immediately left the Cape Fear - Royal Governor Josiah Martin went along for the ride with Sir Peter Parker. As the British Navy and General Sir Henry Clinton's army sailed south for Charlestown, the new Council of Safety met in Wilmington on June 5th, with Cornelius Harnett as President, and James Glasgow and James Green, Jr. as Secretaries. 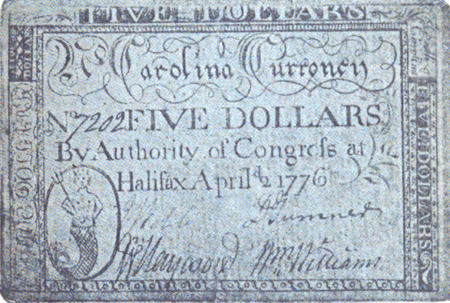 On July 22nd, they were in Halifax when they received news that the Declaration of Independence had been signed and issued - and they agreed to read it aloud on July 27th at the Halifax Court House, and for each county to do the same across the Province. Cumberland County did not do so, therefore on the 6th of August, Lt. Colonel Ebenezer Folsome and Colonel David Smith were authorized to call a general meeting of the inhabitants of Cumberland County to read aloud the new Declaration of Independence and the newly-printed doctrine of treason. On August 9th, the Council of Safety met again. Some sources claim that it sat continuously with greater authority, but other sources claim that it only sat every two months or so. It could now grant letters of marque and reprisal, establish courts, name judges of admiralty, and appoint commissioners to enforce trade regulations. On August 21, 1776, Samuel Ashe was elected as the second President of the Council of Safety, but he resigned on September 27th, and was followed by President Willie Jones. Jones remained the "executive" of North Carolina until Richard Caswell was elected its first Governor later in 1776. It was finally adopted on December 18th, 1776 - the Provincial Congress simply declared it to be in force and did not permit "the people" to vote upon it. Such an important occasion was completed with very little fanfare and very little public attention. This Provincial Congress then authorized the establishment of three new regiments of North Carolina Continentals to be placed upon the line as soon as practical - the 7th NC Regiment, the 8th NC Regiment, and the 9th NC Regiment. They commissioned all officers at this time as well. This last Provincial Congress also passed a series of ordinances providing for the government of the State until the first planned meeting of the new General Assembly. Foremost was the creation of a new body politic - the Council of State. Richard Caswell was sworn in as the first governor on January 16, 1777 at Tryon Palace in New Bern, which now served as the state capitol temporarily.